We supply or supply and install quality rigid kitchens at realistic prices. We offer the latest designs and technology, to create the perfect kitchen for you. We supply BLUM dynamic space products, which are revolutionary for kitchen storage. These products make effective use of your kitchen units, to leave you with optimum storage in terms of both volume and ease of use. We can update existing kitchens with just new doors or go for a completely new look by changing worktops, sinks, appliances and tiling. We have a made to measure range of over 1000 different doors, from modern high gloss to traditional solid oak. We have done this for a number of our existing clients as the design and the cabinets are still in a good working condition but need modernising after 20+ years. This is a great way to revitalise the room at a realistic price. Our accessible kitchen range is supplied rigid to site saving time and cost during the installation process. As explained in the video, we also provide a made to measure service, creating bespoke and incredibly stylish disabled kitchens whatever the space available. 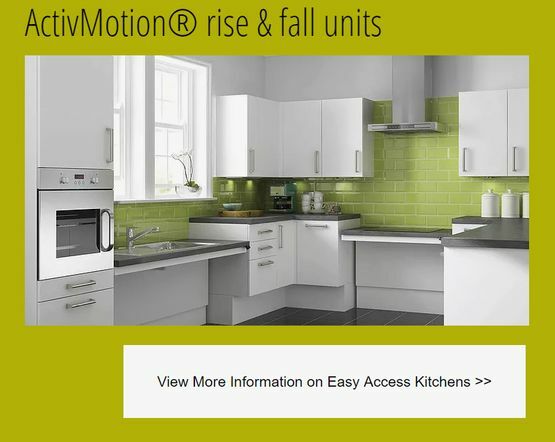 Use the link below or contact our Kitchens departments to find out more about our accessible range or to book your survey. Whichever you choose, you'll be able to enjoy a comprehensive range of attractive and intelligently designed accessories and appliances to add that finishing touch to your kitchen.